Saipranav Kosuri is an 8th grade at Davis Drive Middle School who is an active volunteer in Cary Teen Council, Math Society club, and chamber music club of Green Hope High school. 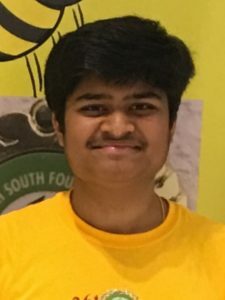 He is about to coach a team for Science Olympiad this season in Davis Drive Middle School for academic year 2018-19.Saipranav placed second in the North South Foundation national Senior Science Bee. He represented his school in the state challenge. and placed first in the the state-wide You be the Chemist Challenge. He represented North Carolina in the National You be the Chemist Challenge and placed in the top 15 in the national You Be the Chemist Challenge, held in Washington DC.He volunteers to help set up, maintain, and sustain various parts of this city to ensure that people can be happy. class="pirenko_team_member-template-default single single-pirenko_team_member postid-4125 samba_theme samba_left_nav samba_left_align samba_responsive ecwd-theme-samba wpb-js-composer js-comp-ver-5.4.5 vc_responsive"